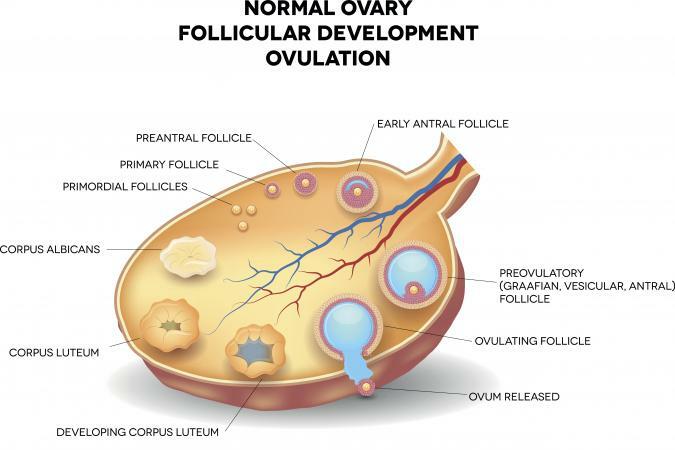 Ovulation is the rupture of a mature ovarian follicle and release of the egg it contains. Precise changes in hormones and other factors during the first half of your menstrual must occur for this event to happen. The process is repeated each cycle. Follicle stimulating hormone (FSH) from your pituitary gland select a group of egg-containing follicles in your ovary. One of these follicles has to acquire specific features to become the leading, or so-called dominant, follicle. The attributes include the biggest size and the most estrogen in the fluid surrounding the egg. The dominant follicle must grow to at least 15 millimeters before it can ovulate. Just before ovulation there is a big increase in production of estrogen in this follicle. This triggers a surge of luteinizing hormone (LH) from your pituitary gland about 12 to 36 hours before you ovulate. This LH surge triggers release of prostaglandins, enzymes, and other factors in the follicle that cause rupture of its wall and release of the egg, or ovulation. If any abnormalities occur in this process, you might not ovulate or the rest of the cycle will be defective. If your menstrual cycles are the average 28 days long, you will ovulate at midcycle around day 12 to 14. The day you ovulate is the most fertile day of your cycle. It also sets the length of the second half of your menstrual cycle. If you don't get pregnant, you will get your period 12 to 14 days after you ovulate, no matter how long your cycle. Once you ovulate, the cells that remain in the follicle (the corpus luteum) continue to make estrogen and increase its production of progesterone. It is the progesterone that changes the cells in the uterine lining (the endometrium) to prepare for implantation of the fertilized egg. Ovulation occurs after a precise, well-timed series of events in the first half of the menstrual cycle. Your knowledge of the process and the factors involved is helpful, whether you are trying to get pregnant or avoid it.